OEM (Original Manufacturer Specs) - 190LPH and 255LPH Walbro fuel pumps are ideal for original manufacture replacements of faulty fuel pumps. When your fuel pump goes and you don't want to spend hundreds of dollars getting a new fuel pump from your vehicles manufacturer or local auto store, OE spec Walbro replacement fuel pumps are a low cost, high quality, and reputable repCometic multi-layer steel (MLS) head gaskets are comprised of three layers of stainless steel. 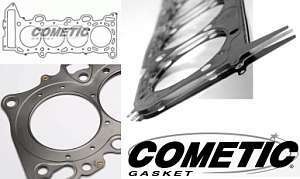 Cometic uses stainless steel for increased strength, it's ability to rebound, and improved corrosion resistance. The outer layers of the gasket are embossed and coated on both sides with Viton rubber to meet the demands of a variety of harsh sealing environments, load conditions and surface finishes. Cometic's Viton coating is heat resistant to 250°C or 482°F. By design the MLS gasket promotes an even torque across the sealing surface allowing for measurable reduced bore distortion.